Organic Valley Farmers' Appeal: Cultivate "Generation Organic" - Support your local organic farmers! If You Can't Be an Organic Farmer, Support One! The more than 800 farmer members of Organic Valley, the nation's oldest and largest organic farmers cooperative, today called upon the all those who want organic food to help cultivate "Gen-O" or "Generation Organic," the new generation of organic family farmers who will be asked to meet America's growing demand for organic food in the years to come. Travis Forgues, 32, Organic Valley dairy farmer from Alburg, Vermont, explained, "The 'Gen-O' movement is not only young farmers like me who are changing the foodscape with their hands; it's everyone who feeds a child or visits the supermarket. When we eat, shop, and parent, we create the future. We need to see ourselves as part of a mission, something bigger than any one of us"
Forgues was joined by four of Organic Valley's younger farmers in presenting action steps for cultivating "Gen-O". Their remarks were made at the "Gen-O Celebration" sponsored by Organic Valley at the Kickapoo Country Fair in La Farge, Wisconsin, on July 29th. "Plant a seed. Help elementary school kids be proud to say they want to be an organic farmer when they grow up," was the message of David (36) and Kayla Roberts (35). The Roberts are Organic Valley dairy farmers from Preston, Idaho who have six children ages 3-13 years. They milk 200 cows twice daily and use a system of intensive grazing on 300 acres of pasture. • Initiate and support legislation for organic education in university agriculture programs. "Gen-O" is the new generation of organic farmers who are taking the lead in producing high quality food for the future while caring for the environment. Organic Valley started Generation Organic in 2004 to nurture a new generation of organic farmers who are the heart of family farming. America lost 4.7 million farmers since 1935 and most of the 2.1 million who remain are over 55 years old. Organic Valley cooperative offers Gen-O educational initiatives including organic educational workshops, educational literature, support of existing farmer training programs, mentoring and internship opportunities. Organic Valley also offers certification assistance, and financial and technical support for farmers transitioning to organic, counseling by the co-op's nationally renowned staff veterinarian, a farmer speaker's bureau, a farmer hotline, web resources at www.farmers.coop and other services. To further support rural communities, the Organic Valley co-op gives a portion of profits back into the communities in which the farmers reside. The third annual Kickapoo Country Fair in La Farge Wisconsin, July 29-30, 2006, celebrated America's rural heritage and the vital role of farming in the country's past, present and future. Hosted by Organic Valley, and free to the public, the weekend long event featured local artisans, merchants, food vendors, rural heritage exhibits, non-profit organizations, a bike tour, farm-related kids activities, farm animals, educational workshops, and entertainment, including "Sinister Dane and the Kickapoo Disco Cosmonuts," performers of populist protest folk with titles like "Mad Cow." Organic Valley Family of Farms is America's largest cooperative of organic farmers and is one of the nation's leading organic brands. 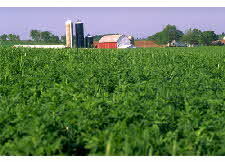 Organized in 1988, it represents more than 800 farmers in 24 states and realized a record $245 million in 2005 sales. Focused on its founding mission of keeping small and mid-sized farmers farming, Organic Valley produces 200 organic foods, including organic milk, soy, cheese, butter, spreads, creams, eggs, produce, juice and meats which are sold in supermarkets, natural foods stores and food cooperatives nationwide. For more information, call 1-888-444-MILK or visit www.organicvalley.coop.